Northumbria Police's Op Dragoon team are today teaming up with Tyne and Wear Fire and Rescue Service, Northumberland Fire and Rescue Service and the North East Ambulance Service to educate the public as part of National Road Safety Week. The awareness week will see officers from the Motor Patrols unit travelling the region to raise awareness about the importance of safe driving. Each day the Force will be offering advice on different ways to make sure motorists don't put themselves in danger when they get behind the wheel. Officers will also be visiting schools, community centres and military bases across the Force area to deliver advice aimed at keeping you safe. The week of action is being led by road-safety charity Brake - they have launched a 'drive less, live more' campaign which calls on drivers use their cars less. They hope that it will help protect vulnerable road users such as cyclists and pedestrians while saving money, making communities more pleasant and helping to protect the environment. Chief Inspector John Heckels, head of Motor Patrols and the Op Dragoon team, said: "We fully support National Road Safety Week, the work Brake are doing and this year's theme of 'drive less, live more'. "We are delighted to help launch the campaign and we will continue to work together with organisations such as Brake to try and make a difference on our roads, such as raising awareness of dangerous driving. 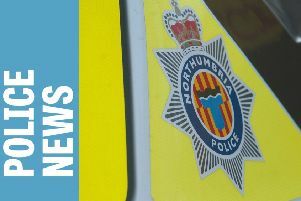 "Operation Dragoon will continue to target dangerous drivers and do all they can to educate the people of the North East about how to stay safe on our roads and look after the most vulnerable road users. "Whether road users are vulnerable because they are on foot or on bike or because of their age and lack of road experience, we are doing all we can to make sure we reduce the amount of crashes in our region." There will be a range of activities during road safety week including a session on motorcycle safety with the Institute of Advanced Motorcyclists and a child car-safety seat clinic at the community centre in Longhoughton. During the sessions officers from the Op Dragoon team will talk about car safety, awareness on vehicle blind spots, winter vehicle checks and drink/drug driving. Police and all of the partners involved will also team up with military staff at RAF Boulmer in Northumberland to identify ways to keep their 650 staff and their family members safe on the roads. Chief Inspector Heckels added: "The Op Dragoon team have done fantastic work within our local schools and communities and it is great that we can now involve our colleagues in the military. "RAF Boulmer have worked hard to help us spread that wider safety message to members of the wider community and they will soon be involved in Community Speed Watch too. "Their commitment is a testament to how seriously they take the issue of road safety and it is a pleasure to work so closely with them." Group Manager for Prevention and Education Dave Jefferson, Tyne and Wear Fire and Rescue Service, said: "It is often the role of firefighters to release seriously injured people from vehicles after road traffic collisions and this task is made even more distressing when the injured people are young. "We are joining forces with Northumbria Police, of Northumberland Fire and Rescue Service, North East Ambulance Service and other partners to drive down road-traffic accidents and help drivers and passengers to stay as safe as possible on our roads." Northumberland Fire Service’s Chief Fire Officer Alex Bennett said: "We are committed to supporting this week. Deaths and injuries on the road affect not just the individual – the lives of families can be destroyed by losing a loved one, or changed forever by having to care for a family member with life-changing injuries. "Everyone has their part to play in keeping our county safe, that’s why we work with our colleagues in other parts of the council, such as road safety officers and highways experts, alongside the police, health agencies and other key partners to minimise casualties on our roads." Simon Swallow, Strategic Head of Emergency Care, Operations and Resilience at North East Ambulance Service, said: "Frontline staff at North East Ambulance Service can attend hundreds of road traffic collisions in their career – some which may be only minor, but many of which can be serious traumatic and life changing events for both the patients and their loved ones, as well as our crews who come to their aid every day. "Everything we do as emergency care workers is designed to protect life, so anything we can do to remind people about the dangers of our roads and the impacts of such accidents will hopefully help to keep them safe. "Operation Dragoon is an excellent initiative in which real emergency care workers can share their personal experiences." Since being founded in spring 2013 the Op Dragoon team has been successful in securing hundreds of prosecutions against dangerous drivers they had targeted in the region. Every day, officers are gathering intelligence on repeat offenders and monitoring those who have been banned from the roads to make sure they don't get back behind the wheel. If you want to report a dangerous driver, or if you have any information that might help make our roads safer, then contact the Op Dragoon team by calling 101 - always ring 999 if it is an emergency.